*After hours rentals are available, call for details. Rentals must be returned 15 minutes prior to closing. 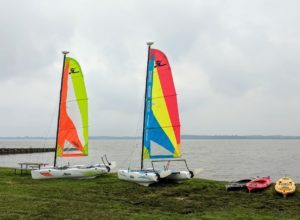 We offer Hobie Wave Catamarans. 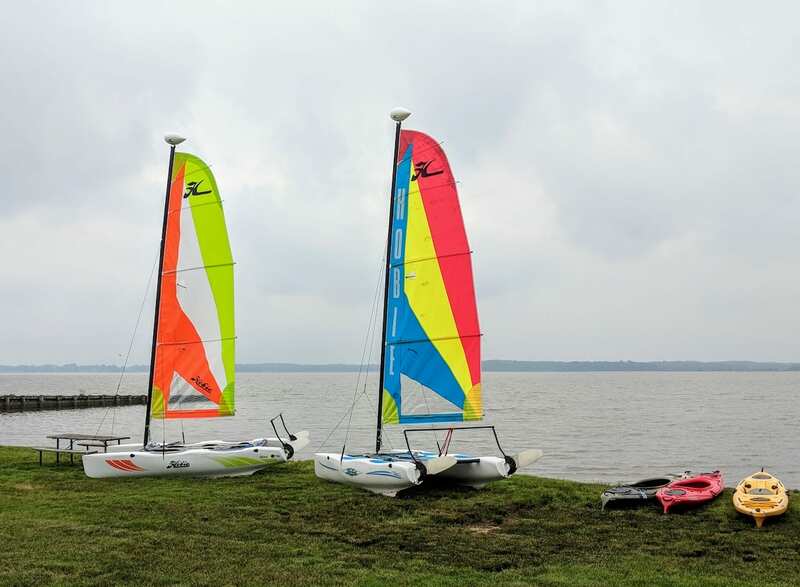 Our rental location is Eastern Watersports @ Hammerman Beach at Gunpowder Falls State Park, 7200 Graces Quarters Rd, Middle River, MD 21220. All rentals include a PFD, Whistle and Paddle. Waterproof bags and cell phone cases are available too. All Sailing Renters must pass a qualification test. This will not count against your time. Rentals are first come, first served. Last Rental leaves at 4:45pm. Children 10 and older can rent with a renting adult. Children under 10 can accompany a parent or guardian. Children 15-17 can rent alone after a qualification test. A waiver of liability and credit card is required to hold as a security deposit. You may pay cash for the actual rental. No checks will be accepted. Waiver is available for download here. Please print, sign and bring with you for your rental. In case of storms, Eastern Watersports will close until 30 minutes have passed since the last lightning flash or thunder is heard. There is a 15 minute grace period on returns, beyond that an additional full hour will be charged. There is to be no alcohol, tobacco or drug use prior to or during the rental. Customers suspected to be intoxicated will be asked to leave without refund and rental.